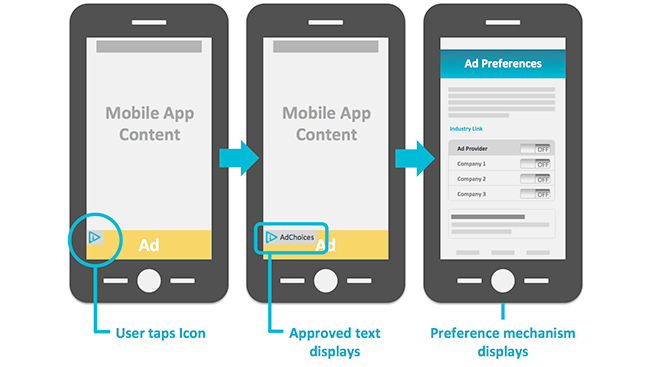 The Digital Advertising Alliance today is releasing creative specs on how the little blue ad marker should be used and displayed on mobile ads—the next major step in extending the DAA's ad choices program to mobile. The blue triangle-shape icon is the cornerstone of the DAA's ad choices program, a visual prompt that allows consumers to opt-out of behaviorally targeting advertising. In the past two years, DAA member advertisers have served up more than a trillion online ads with the icon. Getting the program up and running in mobile has been the industry's focus since last July when it released mobile principles for behaviorally targeted advertising. With the release of the creative specs at today's Interactive Advertising Bureau conference on mobile in New York, the DAA has two more milestones to reach to implement its program by year's end. The mobile specs cover color, size and placement and were crafted to give the consumer a consistent experience—whether online or mobile—and to not obscure ad executions. "We need to make it a consistent brand experience. We have to get to a place where consumer recognition and acceptance grows and we can't get there if advertisers are using different permutations of this," said Lou Mastria, executive director of the DAA. A lot of advertisers are already running the ad choices icon in the mobile environment, which link to the opt-out choice mechanisms provided by Evidon or Truste. The next step of DAA's program is to standardize these opt-out choice mechanism for mobile. The DAA ad choices program is the advertising community's attempt to keep privacy hawks at bay. While the Federal Trade Commission has spoken about the program as an important element of the private-public partnership to protect consumer privacy, other lawmakers aren't so convinced and have advocated privacy legislation.